Certain motivations are worthy reasons to consider alternative cooking methods. If you love the environment—or you’re simply looking for a more effective way of making food—an induction cooktop may be what you’re looking for. 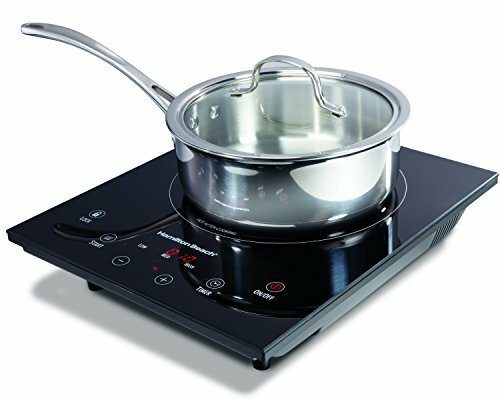 The Hamilton Beach 34102 Portable Induction Cooktop only has one burner which is perfect for small cooking projects. It also makes sense if you need to take cooking gear along on camping trips. You can even kit out a temporary kitchen because this can be your stove and you can heat an induction-ready kettle on this. There are three different temperature levels: low, medium and high. Cooking area is only 5”-10” wide. This may not be sufficient for large cookware when you’re cooking for large groups of people. Induction cooktops are noisy because of the fans that keep components cool. This Hamilton Beach 34102 Portable Induction Cooktop is an excellent option to see if induction cooking is your future. You must prepare for the rather large unit that takes up a lot of space; however, the results may be worth it. What is most important to you in your kitchen? Induction cooking that impacts unnecessary wastage may help you reach these goals. You can save time and energy. What cookware can be used on induction cooktops? If a magnet sticks to the bottom of these types of cookware you’ll still be able to use them. How do you optimize induction cooking? Make sure you supply the correct amount of power to the unit. If you don’t, it will sound an alarm and the screen will note there’s an error. Most home outlets are sufficient but double check so you don’t damage the cooktop or your electrical infrastructure.